Growth Habit: Rope twitch is generally an erect plant but in pastures and mown areas it sometimes assumes a prostrate habit and may not produce flowering stems. Rope twitch produces an extensive root system incorporating many vigorous rhizomes, or underground stems. These rhizomes are white in colour, 1.5-3.0mm in diameter and may be several metres long. The plant grows best in light textured soils which allow easy spread of its rhizomes. The leaves are medium to light green in colour. Leaf blades vary from 50mm to 250mm long and 6-10 mm wide. They are finely pointed at the tips. In cross section the leaf forms a flat “V” in which the mid rib is distinct, but not prominent, on the underside. Type of Plant: perennial, rhizomatous grass. Flowers: The inflorescence consists of spikelets 10-20mm long, each comprising between three and eight florets. The spikelets are arranged alternately in two rows, one on each side of the stem. Fruit/Seed: Seed is released in late summer, although viability is generally low and short-lived. Dispersal: Rope twitch’s main method of reproduction is by its extensive, vigorous rhizomes. The plant can spread quickly through the soil in this way, and densely infest large areas. An infestation may spread by several metres in one year due solely to rhizome growth. 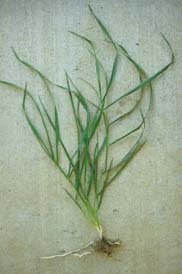 Any rhizome fragments can quickly give rise to shoots and roots, and establish a new individual plant. Great care must be taken when cultivating infested soil, as any soil particles adhering to machinery can carry rhizome fragments to other areas. Seed is of limited significance in the dispersal or spread of rope twitch. Distribution: Rope twitch occurs as a troublesome weed in all southern states of Australia. In Tasmania rope twitch is one of the most widespread weeds in agricultural and horticultural production areas. In recent years it has become widespread in the intensively cropped areas of the North-West coast. It is also one of the main weeds affecting the State’s parks and recreation areas, and domestic gardens. Status: Rope Twitch is not a declared weed under the Noxious Weeds Act 1964. Rope twitch is a competitive weed in areas of annual cropping. It can be particularly important in crops such as onions, which are poor competitors. If present at moderate to high densities rope twitch reduces the yield of all crops, including cereals. In many perennial crops including lucerne and berry fruits, once established it is very difficult and/or expensive to control. Rope twitch is not normally a significant problem in vigorous, well managed pasture with adequate water supply. However should pasture vigour decline it can quickly begin to dominate. In pasture on light textured soils rope twitch is common and may form dense mats which exclude other pasture species. Its occasional prostrate habit in this situation makes it of little value for grazing. In gardens it is generally considered one of the worst weeds in Tasmania. It can infest all plant production areas including herbaceous borders, ornamentals shrub beds, vegetable gardens, potted plants and lawns. If allowed to proliferate unchecked it can become the dominant plant in the garden. Hygiene. Any practice leading to movement of soil or plant material can transfer rope twitch segments to new areas. Strict hygiene practices should therefore be followed to minimise the risk. These include thorough cleaning of all machinery, clothing, implements, vehicles etc. that come into contact with infested areas, prior to leaving the area. Any plant material purchased, such as potted plants, should be carefully checked to ensure rope twitch is not present before the plant is introduced into garden areas. Cultural Control. Rope twitch can be suppressed by employing impervious mulching materials to smother the plant and surrounding soil area. Commercially available weed matting or black polythene sheeting laid over the ground and weighed down with wood chips, pebbles or some similar material works well by reducing air, light and gaseous exchange between the soil and atmosphere. All holes and other potential areas of escape in the matting or plastic must be sealed. The use of these materials needs to be employed over several months to completely kill the rope twitch. Depending upon the material used, this practice may have a negative impact on beneficial organisms within the soil. Wood chip, bark and similar types of mulch, used without a polythene sheet, will not effectively control rope twitch. In these cases the rhizomes tend to grow in the mulch rather than the soil. Physical removal may be relatively easy from this material, although some rhizomes will remain in the soil. Generally any cultural control of rope twitch will allow some regrowth. Continual follow up of treated areas is most important for subsequent years. If follow up is not carried out, small regrowths can rapidly develop into large infestations. Chemical control. A range of chemicals are available which offer varying levels of rope twitch control. For these options to work well, they should be combined with other practices such as cultivation techniques and hygiene practices in a program of integrated weed management. With all programs, spraying should go right up to, and if possible through fence lines, to control the rope twitch completely and prevent re-infestation from adjacent areas. Care must be taken to avoid overspray and damage to non-target plants. For specific recommendations on herbicides for rope twitch control, contact the Department of Primary Industry and Fisheries for a copy of the Rope Twitch Service Sheet or your local rural merchandiser.